For the lesbian, gay, bisexual and transgender community, gay pride parades are not only a great means to raise awareness of LGBT issues and spread the message of diversity and acceptance, but also a much-needed excuse to gather supporters together and party down. At such events in hundreds of cities around the world, LGBT people and their supporters march and dance down the streets behind lavish floats, dress in elaborate costumes, celebrating love, togetherness and, of course, pride for their culture. Tokyo is no different, except for the fact that this year it will be hosting two pride events: Tokyo Rainbow Pride (TRP) on April 29 and Tokyo Pride on August 11. Understandably, the presence of two gay prides this year has caused some confusion among supporters of LGBT activities, begging a host of questions. Among them: What are the differences between Tokyo Pride and Tokyo Rainbow Pride? How did there come to be two parades scheduled this year? And, the big question on the lips of many LGBT people: Does Tokyo really need another pride march? 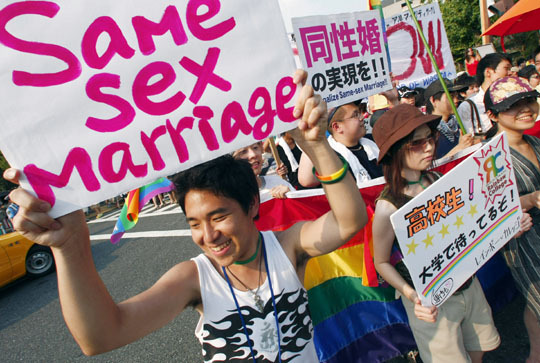 To begin to tackle these questions, it’s important to put this year’s events in the context of the short, checkered history of gay pride marches in Tokyo. In 1994, Tokyo Lesbian & Gay Parade (TL&GP), the first gay pride event in Japan, was organized by the International Lesbian, Gay, Bisexual, Trans and Intersex Association (ILGA) Japan. For the next couple of years, organizers succeeded in garnering a fair amount of media attention, and the parades attracted over 3,000 attendees. However, due to disputes among the organizers, the next few years’ events were barely promoted. From 2004 to 2006, the TL&G parade made a comeback and chalked up some respectable participant numbers, only to then again get bogged down in internal discord over accusations from certain sexual minorities that they were being ignored. In 2007, the name was changed to Tokyo Pride Parade. The following year, planning was abruptly halted, and the city did not host another parade until 2010, only to experience another gap in 2011. Determined not to let another year go by without a pride parade, TRP organizers say they contacted the Tokyo Pride organizers in May 2011 to ask whether they were planning to hold their event on the usual date in early August the following year. “At that time, Tokyo Rainbow Pride organizers were unable to give a definite answer as to whether they’d be organizing an event in the summer of 2012,” explains Hiroteru Inui, one of the organizers of Sunday’s TRP parade. Daisuke Monko, the Tokyo Pride Parade organizer since 2011, has a slightly different take on the story. To more clearly understand the organizers’ motivation for dedicating their time, resources and passion to these pride events, let’s take a closer look at their philosophies and long-term goals. Tokyo Pride is a community-based nonprofit organization committed to protecting the rights of LGBT people and organizing community activities for creating dialogue and social change. The NPO works to dispel prejudice and discrimination against sexual minorities, and to help make it easier for LGBT individuals to live in mainstream society. As an example of the type of work the group is involved in, in June of last year Tokyo Pride, along with other humanitarian groups including Human Rights Watch and Africa Japan Forum, met with Ugandan Embassy representatives to voice their concerns over violations of the human rights of LGBT citizens in Uganda — in particular the criminalization of homosexual conduct in the Ugandan penal code, the antihomosexuality bill that was being considered in the Ugandan Parliament, and the murder of prominent human rights and LGBT activist David Kato. The groups urged the officials to publicly defend the rights of LGBT people in Uganda, to reconsider the antihomosexual legislation, and to bring Kato’s killers to justice. Tokyo Pride activists have made amazing strides in supporting sexual minorities and the LGBT community. The Tokyo Pride Parade is an extension of their activism, focusing on spreading serious messages to Japanese society about human rights. Tokyo Pride has worked hard to build and maintain its reputation for social activism, and this requires a certain level of strictness over which organizations they promote, what decisions are made, and what messages are put out to the Japanese and international media. However, the disciplined culture and vision that has allowed Tokyo Pride to achieve so much has also alienated some of its younger volunteers and organizers, some of whom have a different vision of what “pride” should mean. These are the people who have chosen to part ways with Tokyo Pride and organize with like-minded activists in a new group that they feel better represents them, namely Tokyo Rainbow Pride. Tokyo Rainbow Pride was established in May 2011. TRP’s grassroots philosophy also focuses on the celebration of the diversity of sexual minorities, spanning the full spectrum of the LGBTQ (lesbian, gay, bisexual, transgender and queer) rainbow, hence the name of the group. Their goal is also to spread the message that LGBT rights are human rights, with a focus on creating a sustainable event, celebrated annually, in which the number of participants increases year on year, as seen in gay-friendly cities around the world. TRP organizers are determined to find new solutions for maintaining cohesion throughout the diverse LGBT community. One way they plan to do this is by allowing all organizers and volunteers to have their opinions heard and cooperate in the planning and implementation of pride events. Recognizing the irony of breaking off in order to seek togetherness, this new generation of organizers, in their 20s and 30s, hopes with TRP to abandon the traditional Japanese top-down power structure and develop a horizontal system in which people work together on an equal footing in planning and making decisions. In its attempts to develop a sustainable event, TRP has been organizing, fundraising and holding “buildup events” throughout the year while training new organizers for subsequent pride marches. Since TRP’s inception in May 2011 there have been 10 “countdown parties,” which act as fundraising events as well as opportunities for volunteers and organizers to meet and enjoy themselves while planning for the upcoming parade. Organizers of both pride parades clearly have strong convictions about their visions and goals for their events in Tokyo. However, some people question why there needs to be two pride events, seeing it as symbol of division within the LGBT community. Others are just delighted that there are more gay events — and thus more decadent parties to attend — after enduring a year without any pride celebrations. Anderson volunteered with TRP thinking that she would help pass out flyers. In just a month, her role has expanded to the point that she is now the international PR representative and English website developer. The LGBT community faces enough challenges in Japan without making an issue out of the fact they are spoilt for choice for parades this year in Tokyo, says TRP President Kayo Katsuragi. Toby Siguenza is the Block 3 leader (Tokyo Area) of Stonewall AJET (stonewall.ajet.net) This year Stonewall AJET will be manning the international information booth at Tokyo Rainbow Pride (tokyorainbowpride.jp/en/), providing English assistance. Tokyo Rainbow Pride festivities around Harajuku and Shinjuku will kick off at 11 a.m. on Sunday, April 29, at Yoyogi Park. Stonewall AJET will also be working with Tokyo Pride (www.tokyo-pride.org) in August.